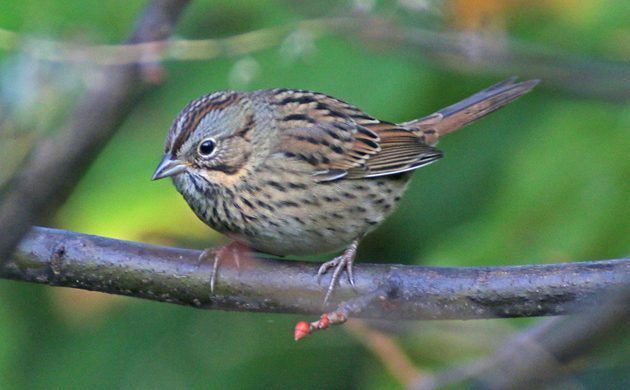 Though it is still September and not really proper sparrow season yet, Corey still managed to turn up a nice Lincoln’s Sparrow at Kissena Corridor Park on Sunday morning, his first of the fall. Such a pleasant little sparrow, and easily Corey’s Best Bird of the Weekend. My annual sojourn to the Eastern Shore of Virginia delivered all manner of tasty coastal specialties from Seaside Sparrow to Piping Plover to Red-headed Woodpecker (not always coastal, but still cool!) Nonetheless, Merlins in their migratory masses took the prize this weekend. They appeared in numbers everywhere, harassing each other or any other bird they could find. At Chincoteague NWR, I was amazed to spy a Merlin playing a dangerous game of cat-and-mouse over the ocean with a Black-throated Blue Warbler. The poor songbird darted back and forth, even falling briefly into the drink, until one last heroic surge led to safety hiding in the sand behind an oblivious beach-goer’s chair. I had New Zealand Bellbirds in my back garden, which is a pretty sweet bird. Best bird…Roseate Spoonbill Jordan Lake mudflats. Believe it or not, pigeons! (Err, Rock Doves.) I had the baby solo for a few days at the in-laws’ in Manhattan (long story), and one morning as he was happily lap-napping, I watched two pigeons land on a windowsill, scuffling over something that one had in its beak (food, I presume?). They were there for quite a few minutes; then the one I am presuming was the victor spent a few more minutes preening. Fascinating behavior that I wish my little monkey had been awake to witness! After three weeks of “fun” travel, I was forced to do some actual work! So, I have to go with the Blue-footed Boobies that I was while delivering a sailboat to the yard for new bottom paint. Tom, you know you lead a good life when you have to make up excuses for “only” having Blue-footed Boobies as your best bird of the weekend. A beautiful Common Loon, still in breeding plumage, here on the Olympic Peninsula.